1. Clinique Quickliner for Eyes Intense in Intense Ivy €17.50 (top photo): The twist up nib means this is always sharp and it goes on silky smooth, with no pulling or dragging at the eye lid. It looks great worn as a defined line or softly smudged, and I love the mossy green colour, too. 2. Lily Cole for The Body Shop liquid eyeliner in violet, €13.95 (bottom right): The slightly metallic finish of this violet liner is lovely but it’s a little watery, so it takes a couple of coats to reach opacity. If you’re looking for a really great purple liner I’d recommend the Avon Supershock liner in Blackberry, or for a waterproof version, YSL’s Dessin Du Regard Eye Pencil in Shimmering burgundy. 3. Eyeko Skinny Liquid Eyeliner in turquoise, €11.00 (bottom left): I’m a sucker for a pen liner and the soft tip of this one is so easy to apply. The colour is intensely pigmented and doesn’t fade throughout the day. In fact, it stays put a little too long - my one bugbear is that this is a little tricky to remove. Eyeko claim that a dab of water is all you need, but staining has been a bit of an issue for me. 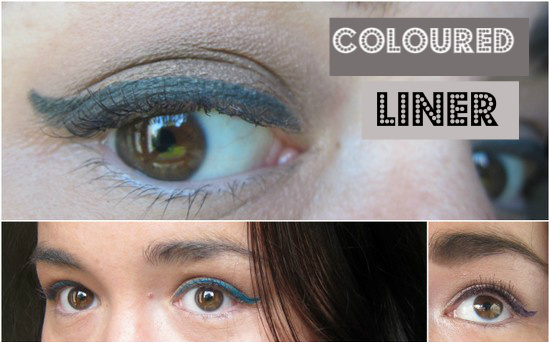 Are there any other great coloured liners I should try? Tell me in the comments! They're all gorgeous colours! Another great eyeliner is 'Electric' by urban decay it gives a great pop of colour! The clinique one is lovely, really suits your eyes! Liner adds do much to the eyes. The violet or navy is a fun alternative to black .. and its always a challenge to draw the perfect line! That turquoise is amazing! Love it on your eyes! I love all of these, especially the turquoise. I need to experiment more with coloured liners. PS I'm sure there was photographic evidence! I love colored eyeliner too! Love the look of the Eyeko one, I'm on a teal kick at the moment!